Manuka honey is often touted as a “superfood” that treats many ailments, including allergies, colds and flus, gingivitis, sore throats, staph infections, and numerous types of wounds. 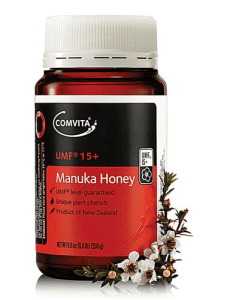 Manuka Honey with a UMF of less than 10 has a low level of activity and may not be effective for some medical conditions. The ideal potency is between UMF 10 and 18. Some people have experienced sensitivity to Manuka Honey with a UMF above 20. Difference between regular honey and Manuka Honey? Manuka honey is a type of honey native to New Zealand and has antiviral, anti-inflammatory and antioxidant benefits. In fact, it has traditionally been used for wound healing, soothing sore throats, preventing tooth decay and improving digestive issue. It is especially good for balancing gut bacteria.This Honey is derived from UMF Manuka honey. Basically, UMF means “Unique ManukaFactor“, which is the method used by honey makers to measure methlyglyoxal, or MG, in a jar of manuka honey. This compound has antimicrobial properties which can effectively kill bacteria, yeast and fungi better than regular honey. 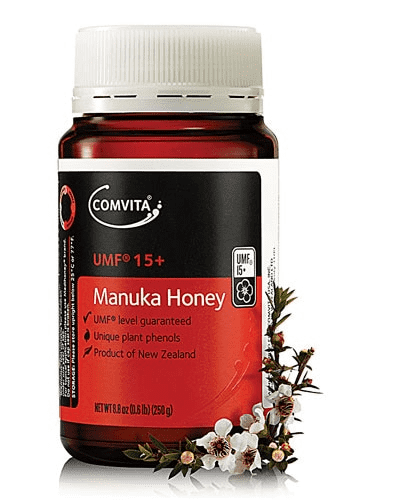 UMF is a quality mark identifying natural unadulterated Manuka honey produced in New Zealand that has the special natural property found only in some strains of Manuka honey. So if you are like me to grab the natural stuff first vs. prescription when a cold, a sore throat or other aches creep in take a spoon of delicious Manuka Honey on an empty stomach! A Spoonfull Manuka per day could keep the Doctor away!